To Quineville (elevenses), Carentan (lunch), Volognes (aperatif) and Ruffoses (dinner). The day also took in Utah Beach and the Orglandes German war cemetery. From the summary above, you’ll see that this was a long and pleasant day! 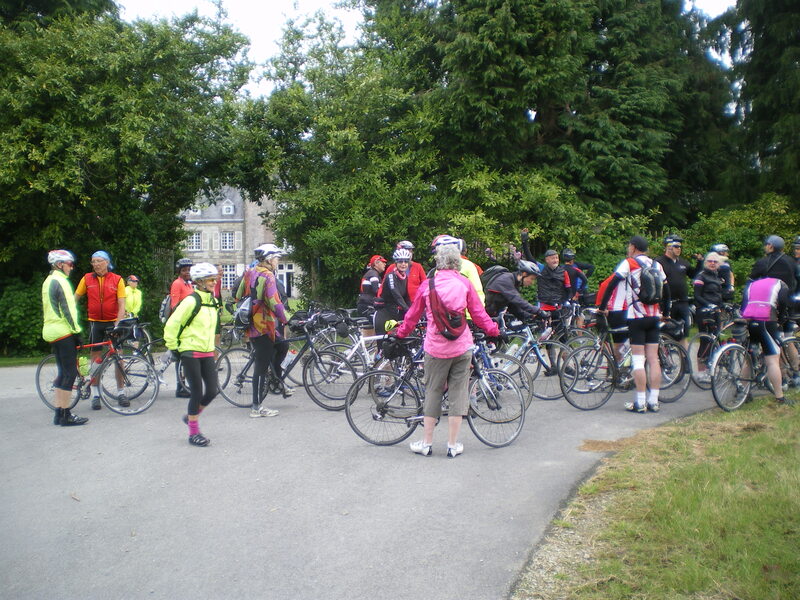 We gîtists made an early start and, by the time we got to the château, everyone was ready to roll. 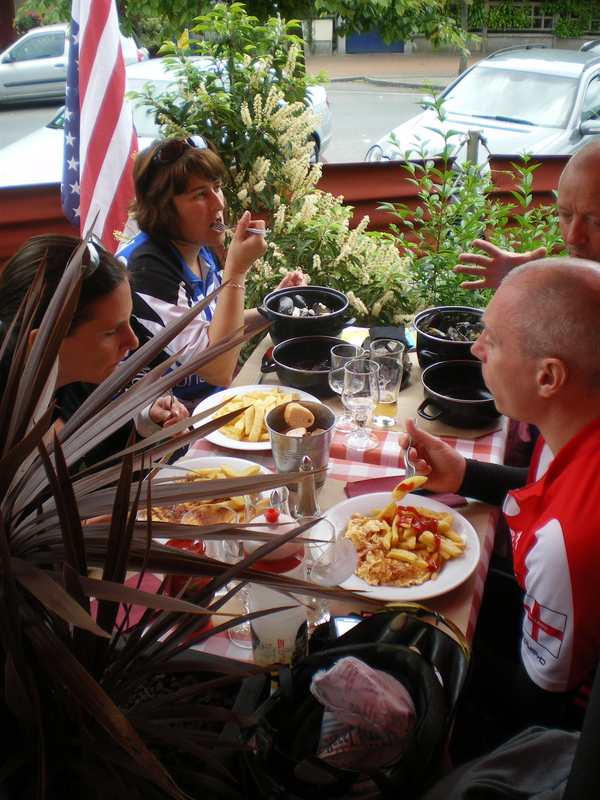 The opening ride was delightful, through hedged lanes, going east to the coast and Quineville – with a lovely coffee stop. 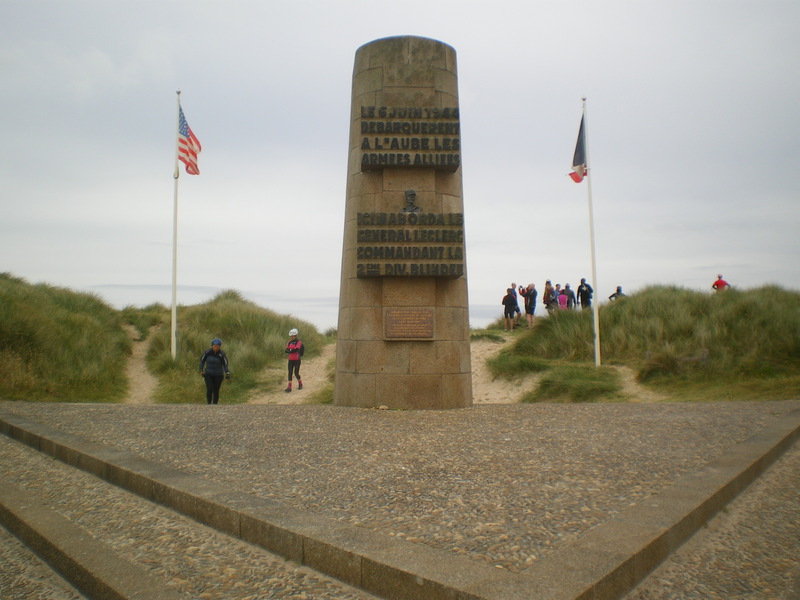 Next we rolled south along the coast, perhaps the only flat part of the Cotentin peninsula and where the American forces had landed on D-Day. 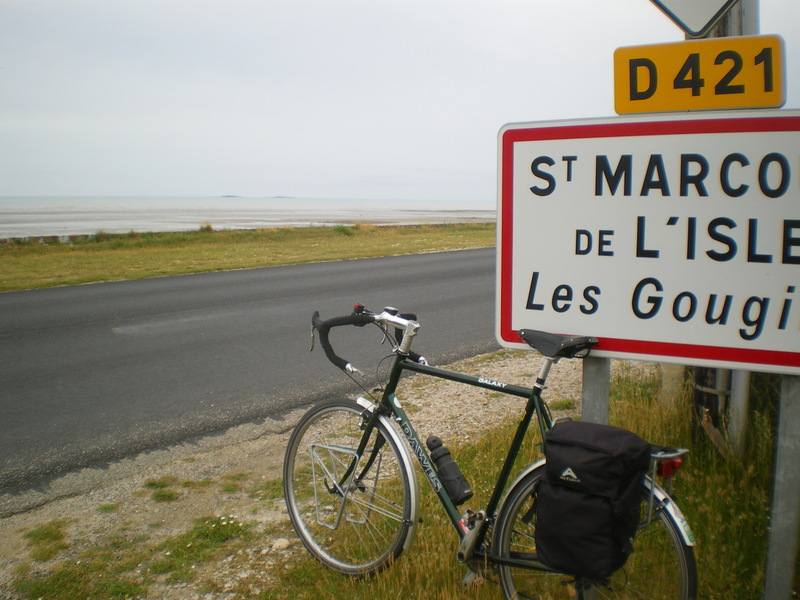 We spotted the Îles St Marcouf, the first part of France which they liberated, at about 4.30 a.m. on 6th June 1944. That’s the Îles on the horizon! We stopped at the monument that commemorates the landing of General Leclerc’s 2nd Armoured Division – the Free French forces – at the beginning of August. We passed the Utha Beach museum. Although suitable sombre, this whetted the appetite for another visit later in the week. 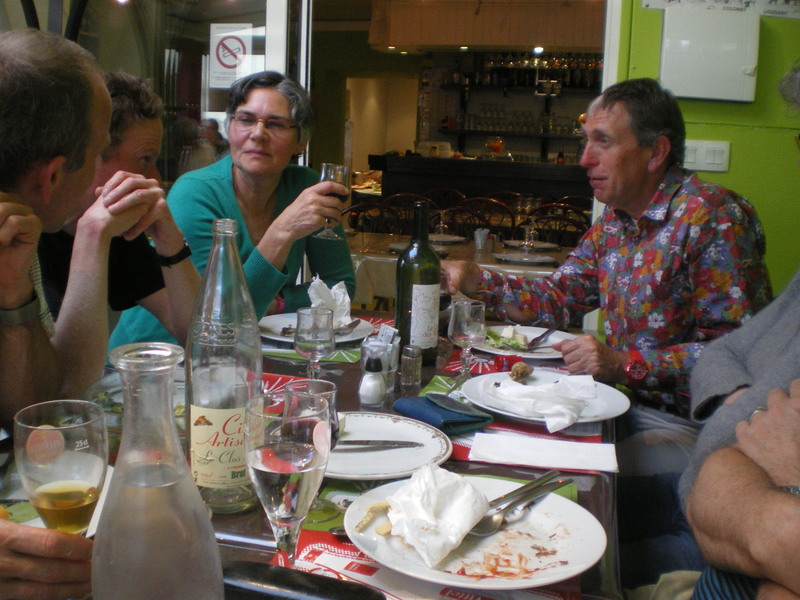 Lunch was in the pleasant seaside town of Carentan. Pâté, steak haché in a camembert sauce, and a cheese plate. My choice too cheesy, you say? Well, I was in Normandy! After lunch we were on and up away from the coast. 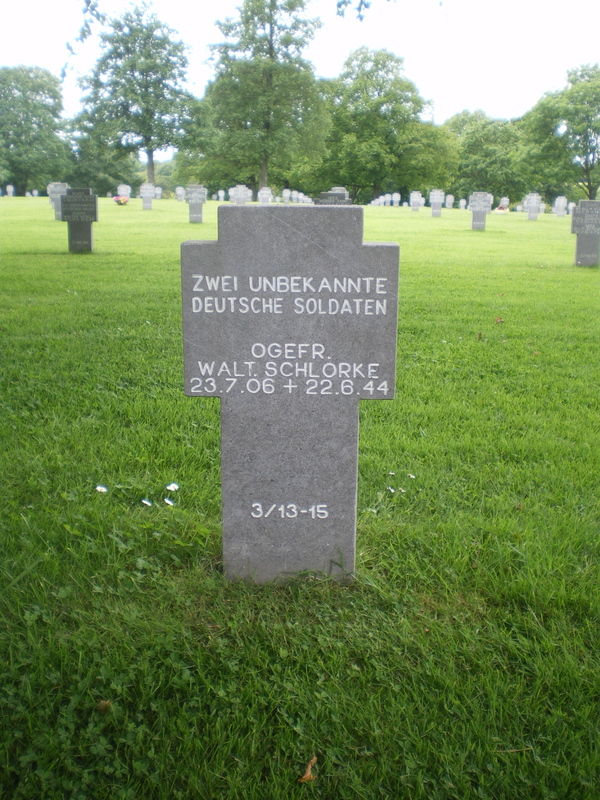 We stopped at Orglandes German war cemetery, where over 10,000 German soldiers are buried from the Battle of Normandy in 1944. Quiet and moving. Cider and calvados at Valognes again! This time only the three hardened drinkers: Olaf, Gordon and myself. Route here. Mileage for the day = 77. Cumulative mileage = 229. This entry was posted in Cycling, The Fridays and tagged Carentan, Chez Cri-Cri, cycling, Orglandes German war cemetery, Quineville, Ruffoses, The Fridays, Utah Beach, Volgones by ianmac55. Bookmark the permalink.